I may not be competing in tonight’s “Bring on the Heat” episode of The Taste on television, but things are definitely getting hot here in my own kitchen. 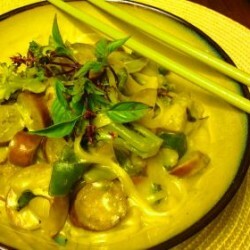 I kicked things off with yesterday’s recipe for green curry paste, a favorite in Thai cooking. Today I’m traveling to another distant part of the globe and using a different variety of chile to light my culinary fire. 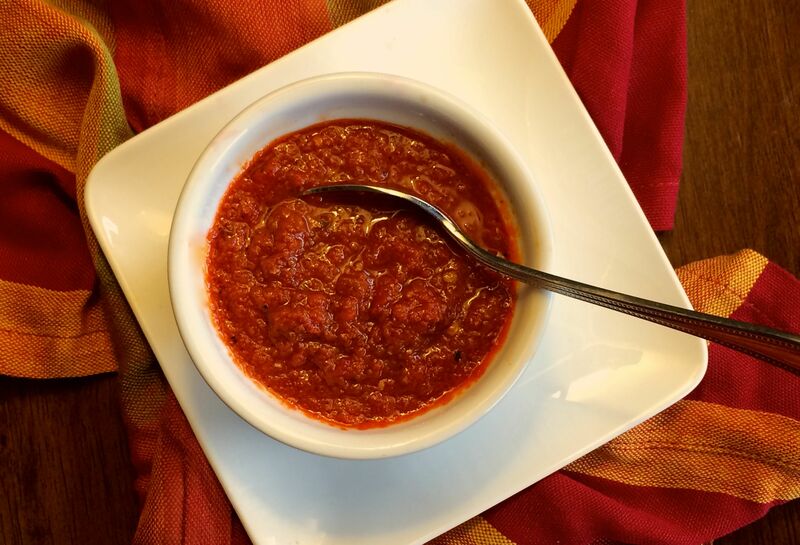 Harissa is a common ingredient in North African and Middle Eastern cooking. 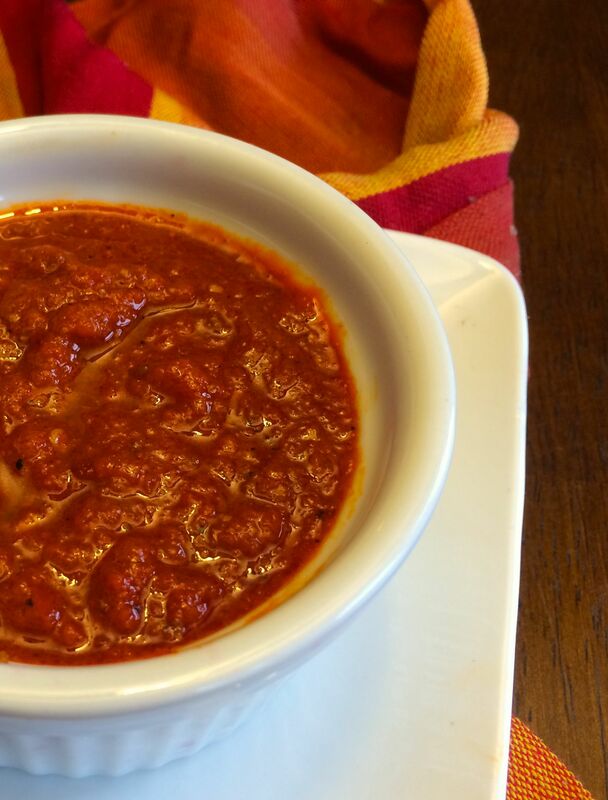 Like its spicy Thai cousin, this bold sauce (or paste) can also be used to season a wide variety of dishes. 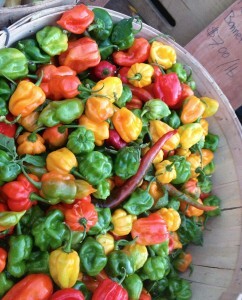 And it’s hot, which should be obvious from its major ingredient, chile peppers. There are so many chile cultivars from which to choose that I’ll let you make your own decision which you use in this recipe depending on your preference for heat. (Though they should be red, obviously.) And if you’re really into chiles—or are a science geek like me—then you can read all about Capsicum to your heart’s desire at the Chile Pepper Institute. Or, you can just learn empirically by jumping right in to make this recipe. Heat a frying pan over low and add the coriander, cumin, and caraway, toasting until fragrant, about 2 minutes. Remove from the pan and cool for a few minutes before crushing them with either a mortar and pestle or a spice grinder. Whiz the peppers, spices, vegetables, and remaining ingredients together in a food processor until smooth. Taste. 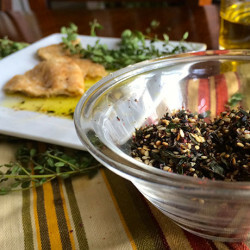 Drizzle in additional olive oil as needed and tweak the heat with crushed red pepper flakes, as desired. Store in an airtight container covered with a thin film of olive oil. Make about 2/3 cup, which will last for weeks in the fridge and freezes beautifully. Recipe adapted from Ottolenghi. 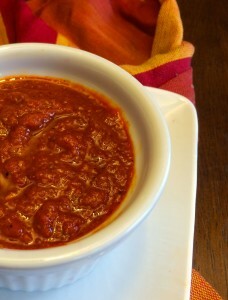 Follow directions here for roasting a red pepper or use a high-quality store-bought version. As I also mentioned in yesterday’s piece on green curry, you should always be prudent when making spicy foods, starting with the lower amount of chiles and going from there. Both of these pastes should even be a bit hotter than you would normally like, because they will be diluted once they’re added to your dish. But proceed with caution even so: the flavors mellow only somewhat, and you can always add more heat later, but you can’t go back. Furthermore, please do wear gloves when handling chile peppers, especially when working with the hottest varieties. I have had a number of unfortunate incidents involving flaming fingertips where I foolishly ignored my own advice. One of those times I spent half the night with my hands plunged into an ice bath for hours on end. My hands were literally on fire. So. Bring on the heat indeed. But keep it in the food, not on your extremities. Also: I so would have won tonight’s challenge. Note: This is Part 2 in a three-part series. Part 1 is here, and part 3 is here.